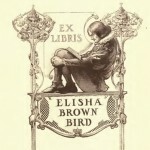 At the beginning of the last century the Boston-based publisher Troutsdale Press published several small volumes on the work of bookplate artists of the day including a 1904 study of the work of Elisha Brown Bird (1867-1943) in E. B. Bird and his Bookplates by Winfred Porter Truesdell. Comparatively speaking the designs of Mr. Bird show a marked tendency towards the photogravure or copper plate rather than the zinc etching. 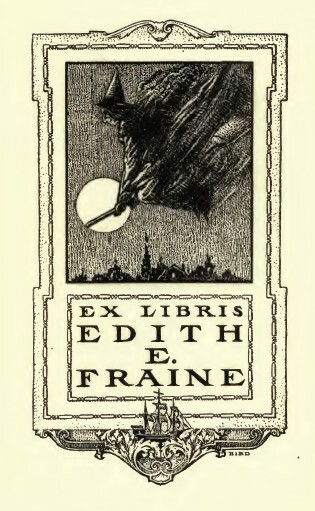 The primary motive of all artists is to have their work reproduced in a manner best calculated to bring out truthfully the various details of the design, and the photogravure process seems to be perhaps the best method, as if the drawing is in wash it will give the same subdued coloring, with a certain richness in the tones, or if in pen and ink will, while giving the bright line of the pen, add to it a softness that is approached by no other method except possibly by the dry point etching. 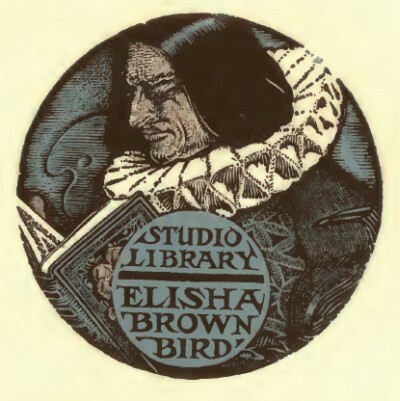 Two of his designs have been engraved on copper and make very handsome finished plates, but in both cases the feeling of the design instilled from the individuality of the artist is lost through hand engraving by another who has consciously or unconsciously incorporated more or less of his own ideas into the design in the rendition of the artist's color,which in the original drawing was in wash while in the finished engraved plate it is hatched without the fine gradation of color which the original called for. 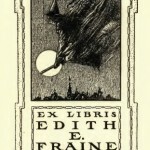 This can be readily seen by glancing over the plates shown in the following pages; take any of the photogravures, for instance, and compare it with the Whiting plate, and it will at once be seen that the individuality of the artist is somewhat lessened and merged into that of the engraver, the mere shell of the artist's work remaining,while the engraver is practically but the reproducer, in much the same manner as is the photo-engraver. By this I do not mean to say that a design cannot be executed in an acceptable manner. 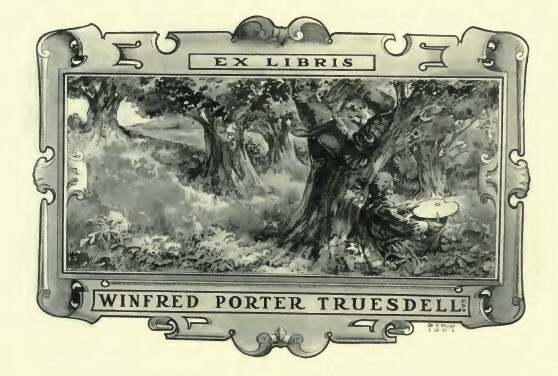 The Whiting plate is a beautiful piece of engraving, and shows the hand of a master in this respect, but it does not reflect the full individuality and color effect of the artist's original drawing, rather it gives one the impression that it had been engraved from a pen and ink design which had very little color in it. 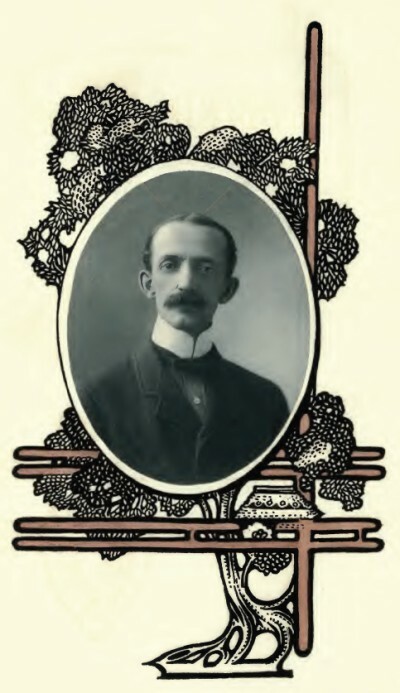 The foregoing does not mean that Mr. Bird draws only for the photogravure process and engraved copper plate. 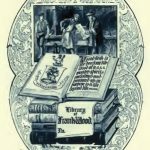 That is merely his preference, and not everybody cares to go to the expense of a copper plate, but must be contented with a zinc etching, of which there arc some few in the following pages. Mr. Bird is really a decorative artist as distinguished from an illustrative artist. All his designs have a strong decorative feeling, as well as his lettering. 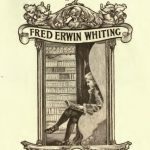 The designs all exude decoration, but without being flagrant; his idea of this is that decoration has a definite place in a book-plate if only for its enriching power, if not used in such a way as to make the salient features of the design subservient to it. The application of this can best be seen in the plates for Frank Wood, Charles H. Taylor, Harold A. Holmes and some others. 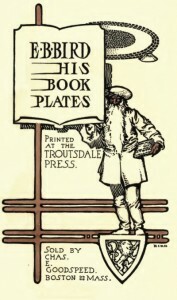 In a cursory glance over the book-plate field here in America it seems to me that the plates are largely the work of so-called decorative designers, most of whose work is strictly in the mercantile line, and it is a question whether a man the bulk of whose work is for mercantile purposes can be as effective in the designing of book-plates which require idealism and personality, as well as strong inventive powers. From the knowledge that I have of the plates of this country, I should take the negative side, with but few exceptions. 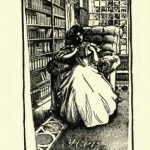 It must be borne in mind, however, that the artist is not always free to use his own ideas on a plate, but is hampered by too many suggestions from the prospective owner. 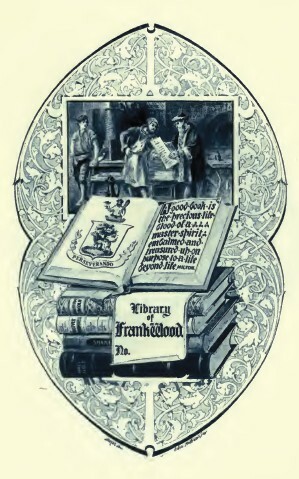 In this connection compare the plate of Frank Wood with the landscape plate of the writer. 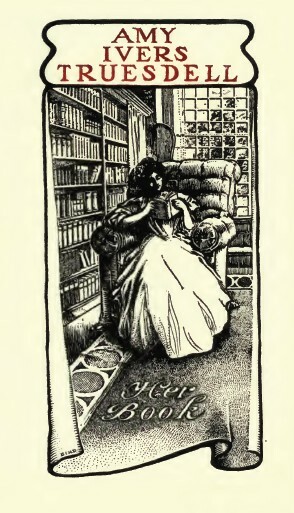 In the former, the designer was held down to certain things, the use of the books, in their peculiar position, the arms and quotation etc., while in my plate there were no suggestions from me whatever, and the result is that as an artistic book-plate it is one of the best if not the best Mr. Bird has made. 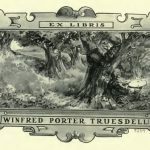 There is a freedom about it and a sincerity quite refreshing, and it is personal in the introduction of the woodland dale, the reader in the fork of the tree and the jester fooling with art. The Wood plate is not so free and lacks the life of the other. 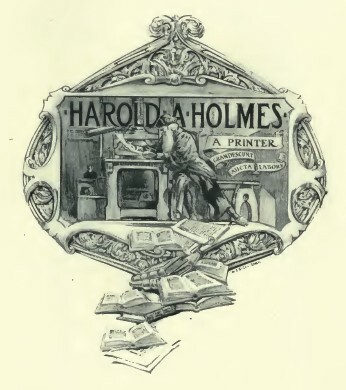 There is no necessity for laborious displays of books on a book-plate, and Mr. Bird has not introduced them except where compelled to do so by the owner, or as an ornamentation, as in the Holmes plate. 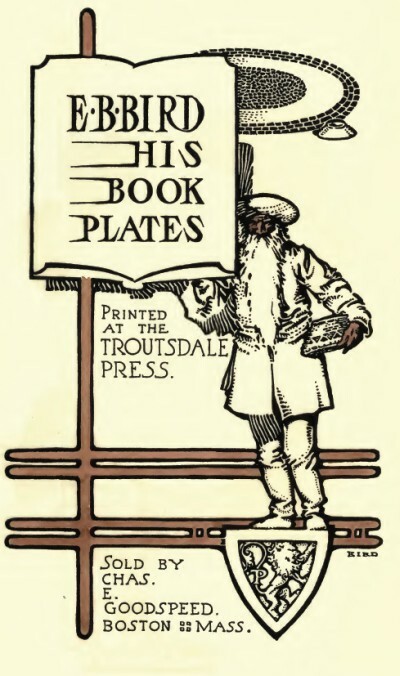 The lettering on all the plates is pretty much the same, but it is readable which is the principal thing; freakish letters have no proper place on a book-plate. 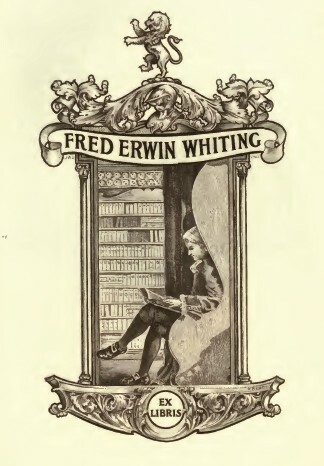 While at the Institute he was always associated with the college publications, and has assisted in the illustration, and superintended the issue of many college annuals throughout the country. During the recent poster craze he was one of the foremost designers, his bold style being very convincing. He has also an enviable reputation as a cartoonist, being at the head of this branch of art on football matters. 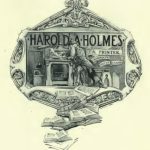 His ideas in book-plate making are to get away from the old rectangular shape and general ideas taken by most designers and turn out something new both in shape and handling of the subject. 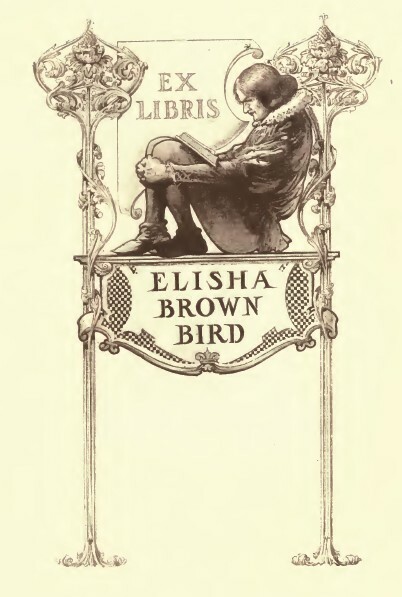 This entry was posted in Bookplate Artists and tagged Bookplate Designer, E.E.Bird. Bookmark the permalink.